When it comes to eco-friendly holidays it seems families lead the way. According to a recent survey for Take the Family, 86 per cent of parents consider the environment when they are choosing a holiday – making them more likely than any other group to opt for a low impact break. With just about every child in the land a mini-expert on melting glaciers, recycling and the imminent extinction of species, it is little wonder that parents have well-honed green consciences. So, having accepted the need to be eco-aware, what are the options for the family holiday? As with all holidays, the less travelling you do, the less environmental impact you will have, so the nearer to home you can stay, the better. British holidays have come on a long way from the image of bleak, dreary boarding houses, in even bleaker and drearier weather. Although the climate remains as unpredictable as ever, the options available for the annual family break have grown almost out of all recognition. That old favourite – the seaside holiday – is still a front runner, but the facilities available have certainly moved on and many directly echo the eco-theme. 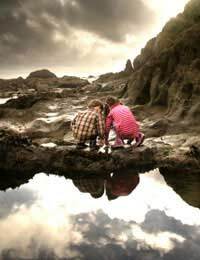 Rock-pooling is as much fun as ever, but attractions such as the many Sea-Life Centres or independent aquaria, including the ones at Macduff beside Scotland’s Moray Firth and in the Welsh coastal town of Aberaeron, help to provide further insights into the life in our seas. Away from the coast too, many holiday companies have responded to the rise of eco-holidaying. Farm holidays remain popular, but a wide range of activities are also now on offer, from the traditional such as boating, cycling and horse-riding, to the more unusual – kite surfing, willow crafting and falconry – and all with suitably eco-friendly accommodation provided. For the inquiringly eco-minded, the Centre for Alternative Technology (CAT) at Machynlleth have a new luxury hostel for stays there, while the white-knuckle riders of the family can try the first eco-friendly roller coaster in the world at Greenwood Park in Snowdonia. Other possibilities include the Project Eco Lodge in Sussex, the Loch Ossian Eco Hostel on Rannoch Moor, which uses renewable energy, recycles water and even has bat-friendly paint, or Centre Parcs – a “flagship for its environmental practice” according to David Sheppard, of English Nature. Even families with very special needs can enjoy a British eco-friendly getaway – the likes of the Thomas Shop, offering respite care amid the beautiful countryside along the River Ithon in mid-Wales. It is not only the domestic holiday market which is moving with the increasingly green times – many operators are offering foreign holidays which also help parents do their bit for the planet. Responsible Travel, for instance, have a vast array of eco-friendly family holidays, ranging from mainstream venues such as France, Greece, Spain, Thailand, Morocco and America to the more unusual, including Transylvania, Mozambique and Costa Rica. Even where the venue is well known, their trips often provide a unique slant – seeing jungles and islands in Thailand or living like a nomad in Morocco, for instance. In each case, the company explains very clearly what it is about each holiday that makes a difference and why it should be considered an eco-friendly break. There are other companies also offering green family trips. The Adventure Company offer a farm holiday with a difference – letting children look after animals and grow herbs in the beautiful countryside in the hills around Sorrento and with Exclusive Escapes, the family can get away to Turkey’s Yediburunlar Lighthouse eco-hotel. Karnataka have rainforest retreat holidays on an organic plantation in Southern India’s Western Ghats, Eco-Africa provide authentic African adventures and Mount Hyland Forest Lodge is an eco-friendly haven set in 1,000 acres amid Australia’s World Heritage forests. “Mainstream” getaways have also been refined to meet the demands of the eco-travelling family. Suitable beach holidays, for instance, are available from a range of operators, offering the obligatory sun and sand in destinations from the familiar Algarve to the more exotic shores of Venezuela, Belize or Zanzibar. At the other end of the temperature scale, ski centres have risen to the challenge, with resorts such as Progression Ski, Saas Fee, Neustift in Europe together with Aspen and the Vail resorts in the US representing this new environmentally aware breed. Whatever makes your ideal family holiday – be it active, relaxed, innovative or traditional – a low-impact version can be yours without literally costing the earth, which is good news when it comes to dealing with the most relentless of green pressure groups – your own kids!